Aprilaire #4510 Replacement Filter for dehumidifier model 1700, 1710, 1750, 1770. Washable or replacable, MERV 8 with foam core and aluminum frame. 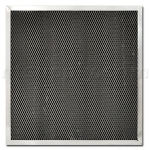 Dimensions: 17-3/4" x 16-7/8" x 7/8"
The air filter in the dehumidifier should be cleaned or replaced once per year. A clean filter allows the dehumidifier to run at full capacity and prevents damage to the dehumidifier. To remove the filter, unplug or disconnect power to the dehumidifier. Remove the filter by removing the filter access door on the side of the unit. The filter can be cleaned by flushing with warm water and a detergent solution. Allow the filter to dry before reinstalling in the dehumidifier. Reinsert the cleaned or new filter, replace the filter access door and reconnect power/turn on the dehumidifier.